If you want to know the ground beef jerky recipe dehydrator then, you have to read the below article in which we are going to tell you two different ways of cooking this fantastic snack. In one way we will use the jerky gun for making the jerky, and in another way, we will make use of the standard appliances available at home. All the steps given below are quite easy to follow, and we are sure that after reading the below recipe you will surely prepare a ground beef jerky recipe with fantastic taste and right chewiness. 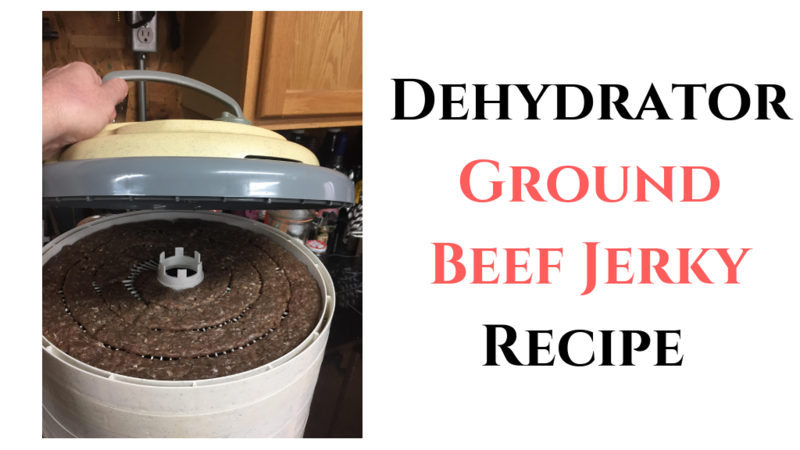 How to Make Ground Beef Jerky recipe dehydrator? We have told you earlier about the two ways of cooking ground beef jerky, i.e., with a jerky gun as well as with some other kitchen appliances (without a jerky gun). You can pick the method that suits you the most. It does not affect the results of the recipe. You have to pick a lean ground beef that does not have more than 10% fat. In this recipe, we are using the 96% lean meat and 4% fat of the meat. Now, the next step is to do the seasoning of the ground beef with the help of the ingredients mentioned above. You have to marinate the entire meat pieces and mix them well. After the marinating, keep them inside the fridge for around 4 to 24 hours period so that the ingredients bind correctly with the meat. You should use the liquid ingredients less, i.e., approximately 1 oz. for 1 pound of beef jerky. If you don’t have the liquid ingredients then, you can use the cold water for marinating. Now, take out the beef jerky from the refrigerator and fill some ground beef inside the jerky gun. Remember, don’t fill the jerky gun with too much meat. There should be no air sacks inside the beef when you are stuffing the tube as the air sacks can stop the beef from getting filled together and in the long ribbons. It’s time to shoot the jerky strips on the trays of the food dehydrator. You should have a handy knife that can cut the ground beef far away from the outlet of the jerky gun after you take out the preferred length of the meat strip. After this, you can start making the other piece of the ground beef jerky. Switch ON your food dehydrator and dehydrate your strips of ground beef jerky at a temperature of 160 degrees F for the period of 3 to 8 hours. After three hours, check the status of the drying after every half an hour. If your jerky gets bend without getting the break then, it means the jerky is ready. The jerky should be soft while touching and there should be no hardness outside. Now, store the ground beef jerky in the airtight container or Ziploc bag and keep it in the fridge for long life. You can also freeze them for more long-term usage. Now, we will tell you the recipe of the ground beef jerky without a jerky gun. In this recipe, we will use the knife and other things instead of the jerky gun for cutting the strips. Now, the next step is to do the seasoning of the ground beef with the help of the ingredients mentioned above. You have to marinate the entire meat pieces and mix them well. After the marinating, keep them inside the fridge for around 4 to 24 hours period so that the ingredients bind correctly with the meat. You should use the liquid ingredients less, i.e., about 1 oz. for 1 pound of beef jerky. If you don’t have the liquid ingredients then, you can use the cold water for marinating. Now take out the ground beef from the fridge and put it in the cookie sheet creased along a parchment paper. Now, with the help of a rolling pin roll out the ground beef to around thickness of ¼ inches. Cut out the strips of the jerky with the help of a sharp knife around 1 inch wide. Do not concern about the cutting of the paper. The pieces should cut in such a way that it gets broken easily after the process of dehydration. Now keep the strips on the trays of the dehydrator and set its temperature at 160 degrees F for drying. It will take around for 3 to 8 hours for completing the entire drying process. After 3 hours, check the status of the drying after every half an hour. If your jerky gets bend without getting the break then, it means the jerky is ready. The jerky should be soft while touching and there must be no stiffness outside. You can store the dried ground beef jerky in the refrigerator after cooling down in an airtight container or sealed packs. But don’t forget to cool it down entirely before the storage. Why Use the Ground Beef for making Homemade Jerky in a dehydrator Instead of Beef Strips? The ground beef is cheaper to buy than the roasted beef. You can easily make the jerky out of the ground beef as rolling out the meat from the jerky gun in this form is quite easier in comparison to the cutting of the strips of beef having tissue and bine intact. You can easily chew the ground beef jerky in comparison to the regular beef jerky due to the presence of connective tissues in the regular beef. The ground beef jerky possesses salty, jerky and the meaty flavor that does not get stuck in your teeth. Use the latex gloves while mixing the spices and other ingredients with the ground beef. You should also wear them at the time of loading the beef inside the jerky gun. You must assure that you are using the curing salt while making the recipe of ground meat jerky. However, it is optional, but you can use it for the safety of your food like ground meat jerky. If you pre-heat the strips of beef at an internal temperature of 160 degrees f then, this can help you in killing any probable bacteria. It must be done at the commencement of the dehydrating procedure. Ground beef jerky is one of the favorite snacks that people love to carry along with them on long trips and journeys. It offers an excellent amount of protein that keeps you full for a long time. Kids also love to eat it in the form of snacks. So, don’t wait for more and prepare this recipe today. We hope that you like the above ground beef jerky recipe dehydrator. You can use any of the above-discussed ways of cooking the ground beef jerky. Both of them will provide you with good results in the end. If you have any question reading the above info then, didn’t hesitate to ask us anytime here. Please share your experiences after making this recipe in the below comment box. If you want some other favorite recipe of yours then, also let us know. We will provide you that soon!